Guides you through the research process, including selecting a topic, using Google Scholar, finding resources, reading citations, and creating a bibliography. Note: This page will be replaced May 2019 with a redesigned Quick Start. The new Quick Start uses a simpler and more intuitive navigation to address common questions with the research process and using the library, and integrates with our Research Now! curriculum. Please see https://guides.lib.uconn.edu/quickstart and let us know what you think! Google Scholar [scholar.google.com] is different from Google. Google searches public web content - if your instructor says not to use Google, they probably mean they don't want you to use content from the public web. Google Scholar, however, searches journal and conference papers, theses and dissertations, academic books, pre-prints, abstracts, technical reports and other scholarly literature. Is Google Scholar right for my research? locating more information on partial citations. For example, Google Scholar can often find an article with just the title, and will provide the full citation and access to full text options once you have set up Google Scholar. discovering keywords that define your topic. helping a beginning researcher identify journal titles and authors connected with subjects of interest. finding "gray literature" like conference proceedings. It includes many articles that wouldn't get included in other indexing services. highlighting highly cited works on the topic. Searching in Google Scholar is imprecise when compared with discipline-specific databases. If your research requires very comprehensive searching, or if you are not satisfied with Google Scholar's results, use individual research databases. On-Campus? 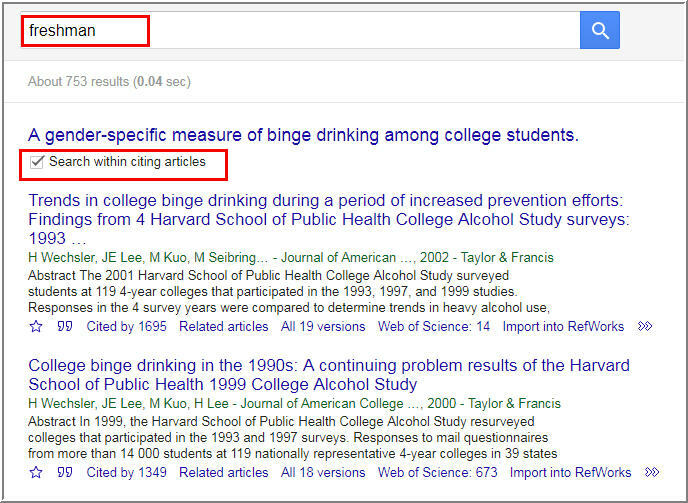 Google Scholar will automatically display links for access to the full text of search results. Off Campus? 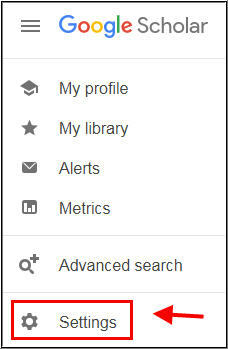 Set Scholar Settings (From scholar.google.com , click on the Menu icon in the upper left corner and select "Settings") to configure Google Scholar to access UConn resources and enable exporting of citations to RefWorks. 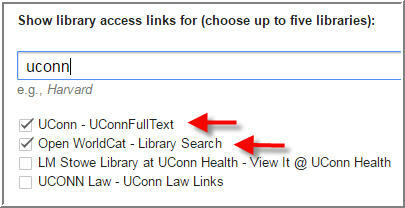 Below the "Show library access links"
enter UConn in search box and check the box next to "UConn - UConnFullText"
repeat search with Open Worldcat and check "Open WorldCat - Library Search"
From the Scholar Settings Search Results page, scroll down the page to Bibliography Manager. select "Show links to import citations into RefWorks". Other tools available are BibTeX, RefMan and EndNote. You can also export citations directly from the Cite screen. UConnFullText, [PDF], [HTML], [DOC] - or have no notation at all. If a notation is displayed, click the link to access the full text. HelpMeGetIt may provide ways to access to the article, OR a link to request a copy through Interlibrary Services if we do not have online access. 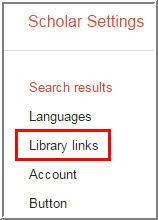 If the access link does not work, or if there is no link, take your request directly to Interlibrary Services. This service obtains scans or loans of materials from other libraries, and is available without charge to UConn faculty, staff, and currently enrolled students. NOTE: links to non-UConn resources may inform you that you will have to pay to see the full text. Don't pay! You can generally obtain any Google Scholar result free through the UConn Library's sources, such as databases, UConn WorldCat, the Library's General Search or by ordering the paper, article, thesis, book, etc. from Interlibrary Services. The Cited by link under the Google Scholar citation is another way to expand your search and find more relevant articles. When you click on the Cited by link, you will find other publications that cite the article. 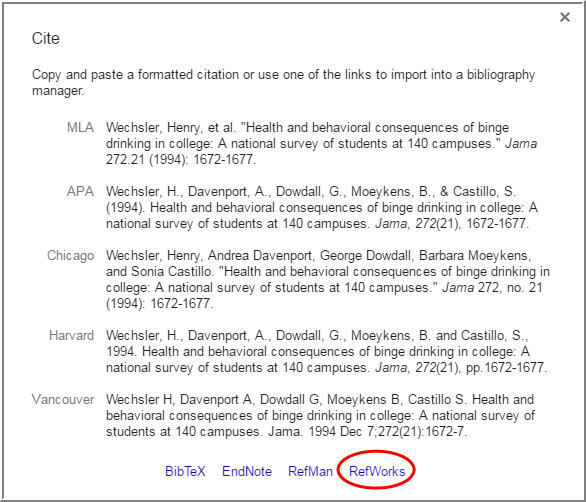 You can also search within the publications that cite the article. 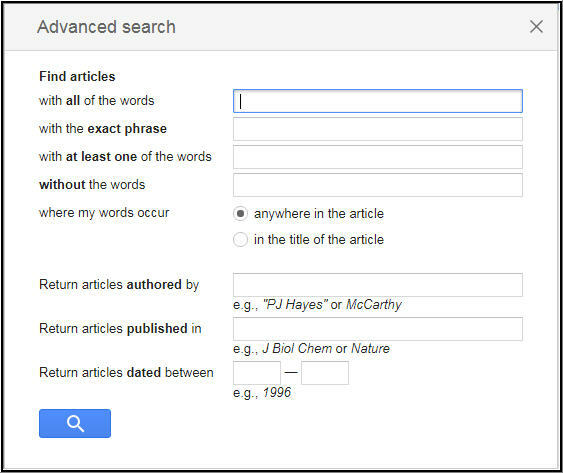 Select the checkbox that says "Search within citing articles" and add additional terms to narrow your search. 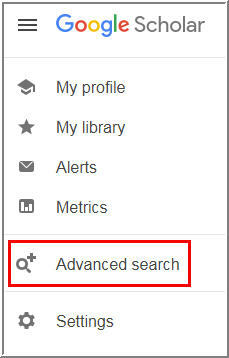 To refine your search results, use the limit options to the left of your search results. To use Google Scholar Advanced Search options, click on the menu icon in the top left corner of the Goggle Scholar homepage. Advanced Search lets you search in the author, title, and publication fields, as well as limit your search results by date. Cite: click on the Quotation Mark icon to open the Cite Window. Copy and Paste the formatted citation or use one of the links to import the citation into a bibliography manager such as RefWorks.